She remembers the officers telling her ‘We’re here to remove your son,’ and her replying, ‘Nobody is touching my kid without a court order or a warrant.’ The officers reportedly did not present any papers…” – Deanna Robinson, victim of police brutality and cruelty. Call the Hunt County Sheriff’s Department at (903) 453-6800. Express your outrage, say whatever is on your heart; voice your feelings… And please, spread the word; I explained how I’ve seen Deanna’s video (below) and pictures and that the period of cops beating and killing without punishment will come to an end. These inhumane, remorseless acts of brutality will NO LONGER be tolerated. 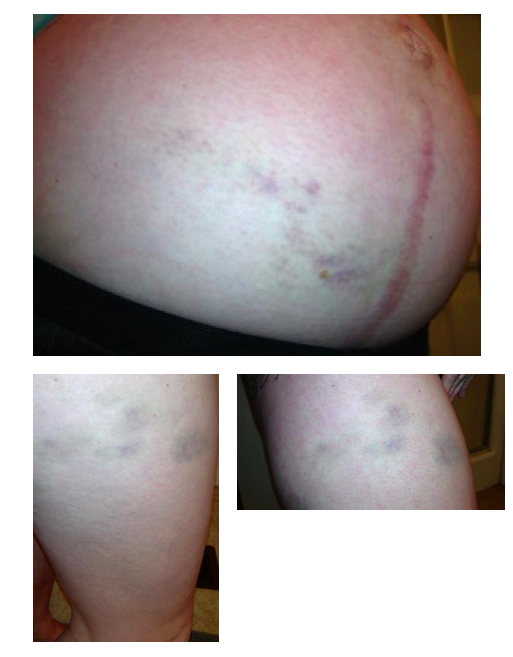 Deanna’s bruised stomach and legs after police beat her. I wrote a massive article on this earlier and somehow it has vanished… This case enrages me so much I ended up making the following video about Deanna Robinson and the twisted cop who punched her numerous times in the stomach despite her shouting “I’m pregnant!” Despite her being 38 weeks pregnant and clearly showing that she would be giving birth to a new life any day. All of this happened in front of her toddler, whom they took from her. He watched, 18 months old, as two cops kept his mother, Deanna Robinson, in the corner of her kitchen as she tries to protect her stomach. In between the sadistic punches aimed clearly at her pregnant stomach, she was then handcuffed and arrested. These criminals came in to her home with force, hurt her physically and emotionally, traumatized her 18 month old child who had no say in anything and had been through enough in his short life. No one showed any sign of caring for the SOUL, for comforting the struggles and pain in which Deanna, as any of us would, tried to cope with. They wanted to take away her son due to her previously abusive ex-boyfriend. Her hormones are so out of control given how far along she is in pregnancy…all she needed was some kindness. New Page For Women and Abortion – & Emergency in Texas! Please click HERE to access it, it will take you to my latest post, which is for the women of Texas. No matter what, please, please don’t stay silent. Please at least share the page, tell someone… We must help these women and clinics…. Please check it out, again link HERE. I don’t understand why more people are not upset and outraged over how this world is; from police brutality to lack of women’s rights as well the stigma placed upon important things such as abortion, mental illness, etc. What I am currently furious about is the term “Pro-Life” being used by anti-choicers. Here is why. 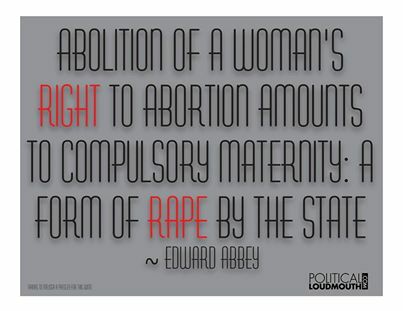 Abortion is Not Evil & Shouldn’t be ILLegal- & Why Has Billions Been Given to Anti Choice Groups? Lies the anti’s tell… The past few days I’ve been reflecting a lot after reading how corrupt and money hungry these religious zealots in office are. What if last year had happened this year; how would I have saved my life? I couldn’t have. I’d be dead. It’s not me I worry about now so much though… It’s the women who feel like I did, what is to happen to them and their lives? How many deaths are we going to see…? Before I go on, again, I apologize that I still haven’t completed the abortion video much to my annoyance; I am trying to make it organized as possible, but with all the work, volunteer and other projects I do, editing this video has proven to be a mistake. If I can’t finish the final version soon I’ll just upload the original. Same with articles and emails/messages; I’ll be back on top of things shortly. On to the post. Due to time related issues I’ve had to wait longer than I anticipated in posting the abortion question video as well as articles on abortion and other problems in society. Hearing from and speaking to so many women has inspired me to fight even more for the rights of women and for the right to abort. However, knowing my story; and hearing theirs has also brought me great rage. Anti’s want to close clinics claiming they aren’t safe for women to have surgical abortions in them because one woman was taken in a car as opposed to an ambulance during a complication, and other stupid claims made up by the anti-choice government and religious zealots.